One of my FAVORITE wall decors in the house is the Chinese FAN. I bought it at an Asian store in Stratosphere during our 3rd visit to Las Vegas. I believe it was on sale for $25.00. Original price was $60. 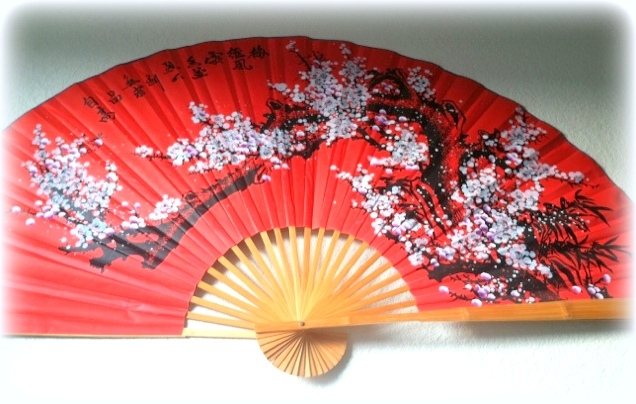 The FAN is large, and it is called the "Prosperity Blossoms". "This beautiful hand-painted Chinese wall fan depicts cherry blossoms amid an all-red background, which is symbolic of luck and prosperity in Chinese culture. The cherry blossom is an important flower and symbol in Chinese and Japanese culture. It signifies feminine beauty and is also the symbol of love." Looks like something my middle niece would FANCY! I have a feeling that it graces your home beautifully! A real treasure, esp because it gives you pleasure. Beautiful and vivid colors. I think there is something so exotic about fans. A lovely ornament! It's such a happy object in your surroundings. That is beautiful...my mother left me her collection of fans, most being Japanese though. I have an identical fan at home...nice. That is really beautiful, mommy. :) You got a good deal on that one as well. Visiting you back! This is a beautiful fan...something my wife would love. hahaha dakoa ana Dhemz oi pero perfect na diri sa kainit, kaapan kay basig tubu-an ta ug kulani sa ilok ana ug pinaypay, nyahaha. sa May pa mi pohon mubalik Dhemz..agi ko from WW.